How to Control Android from PC Effortlessly? Home> Resource> Android Backup> How to Fully Control Your Android from PC? Is it possible to access and manage your Android device on a computer? Certainly YES! However, to control your Android from PC, you need to turn to some professional tools. So here, in order to help you perform the Android remote control effortlessly, we would like to introduce you the best tool for controlling Android from PC - MobiKin Assistant for Android. Let's take a look together! Part 2. How to Complete the Android Remote Control Using the Tool? 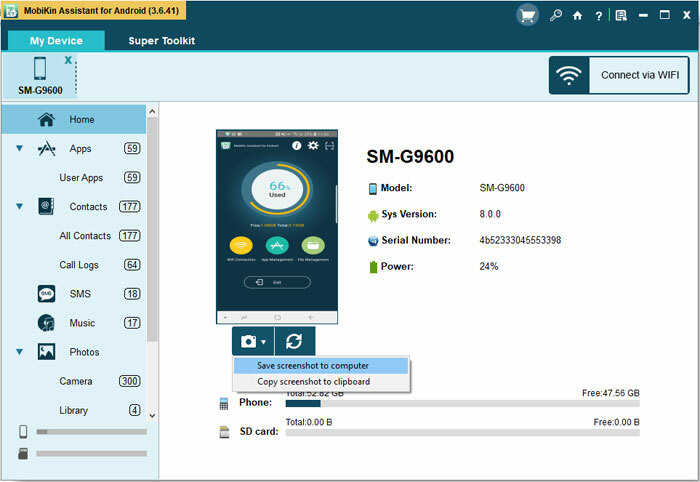 MobiKin Assistant for Android is a desktop program which allows Android users to access, backup, restore, and manage their phone data on computer without restriction. With it, you can view your Android contacts, text messages, call logs, photos, music, videos, books and Apps on Windows/Mac computer and then export, import, edit or delete them freely. Apart from that, its highlight is that it supports to backup and restore with 1 click. So if you are looking for a tool to control your Android device from PC, it could be a good choice for you. How to Complete the Android Remote Control Using the Tool? 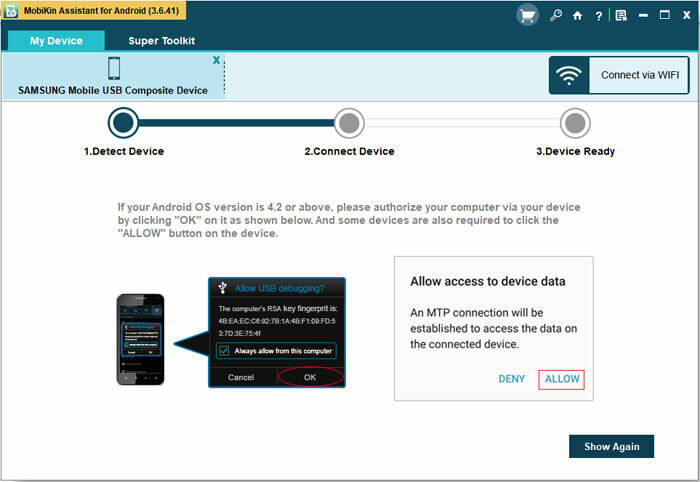 To control mobile phone from PC using this tool, you need to build a connection between your Android phone and computer first. You can connect them via Wi-Fi or USB as you like. After that, you need to go with the on-screen prompts to make the connected device be recognized. Once your phone is recognized successfully, you can begin the Android remote control. 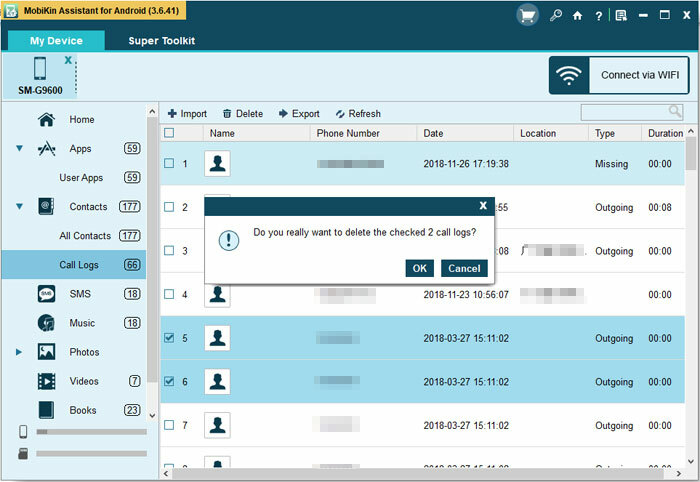 On the primary interface, you will see the parameter and controllable files of your mobile phone. Here, you can tap on the folder like "Contacts", "SMS", "Music", "Photos", etc. in the left panel to access and preview its contents. If you want to find a specific file, you can type one or two keywords in the search box at the upper right corner. 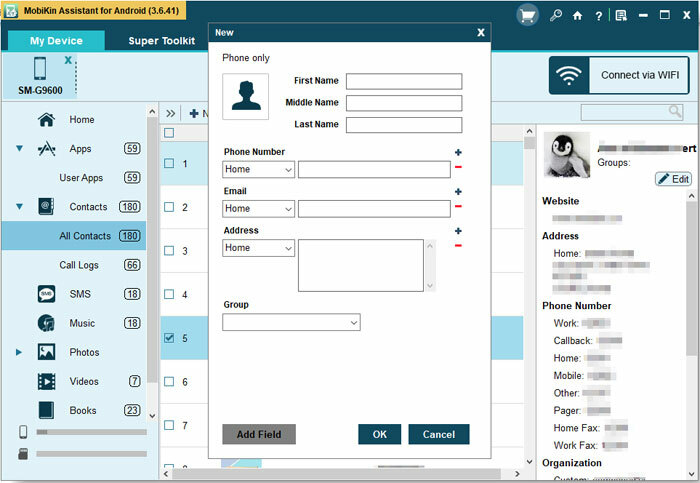 It empowers you to add a new contact or edit the existing contact info on the computer as well. 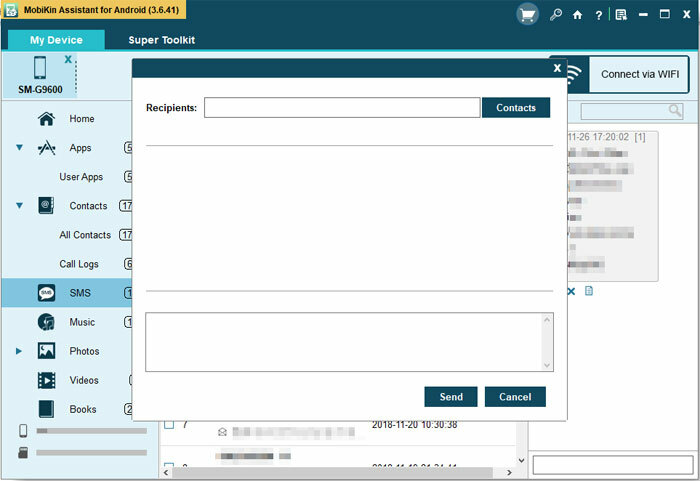 - Add contacts: enter the contacts folder by clicking "Contacts" > "All Contacts". Then tap on the "New" button and then you can add the info as you like. - Send messages: navigate to the "SMS" option and then tap on "New" at the top menu. After that, a window will pop up. You can type the messages in it and then select one or several contacts as the recipients. Finally, you can hit "Send" to send the messages. - Resend, forward & copy messages: choose the conversation containing the message that you want to resend, forward or copy under the "SMS" section. Then move your mouse to the text that you want to manage and four icons will appear - resend (only appears when you fail to send the message), forward, delete and copy. Just tap on the corresponding icon to achieve your goal. One of the main features of this tool is the transfer function. This feature enables users to transfer files between Android and computer without any restriction. And what's more important, the transferring process is easy to complete - only several clicks can you complete the transmission. 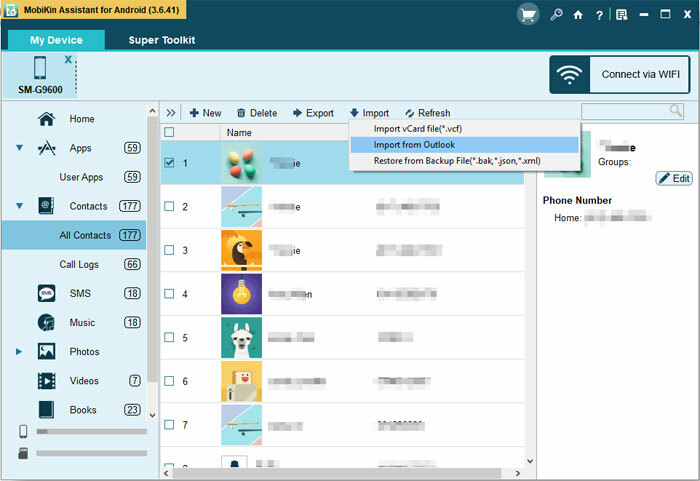 - Transfer files from Android to PC: choose the wanted folder > select the data you want to transfer > hit the "Export" option. - Transfer files from PC to Android: enter the folder that can save the files you are going to transfer > tap on the "Import" > elect the files from computer to move them. Removing the unwanted or useless data on Android device is also available. To complete that, you just need to enter the folder and mark the data that you want to remove. Then you can simply click the "Delete" button to delete the selected files. The "One-Click Backup & Restore" function could be the most powerful feature of this program. 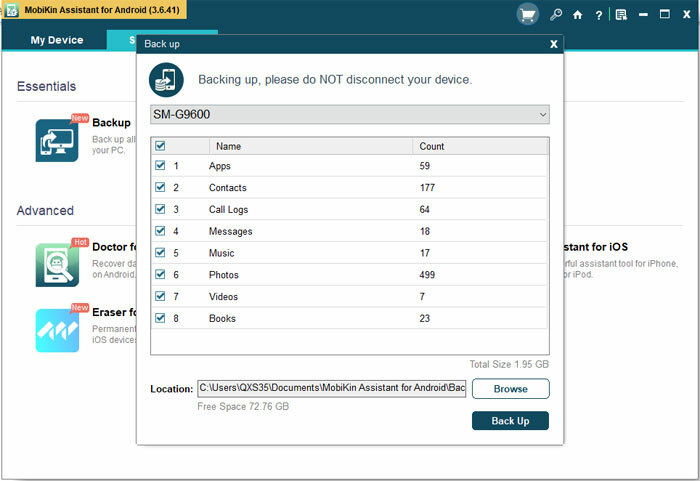 With this feature, users are able to backup all the files in their device and restore the backups with one simple click. 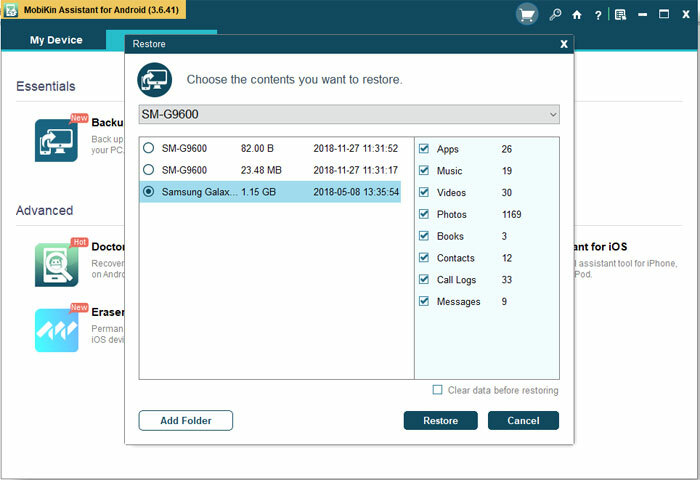 For those who wish to make a backup for their Android phone data, this would be the best choice. - Backup Android: choose "Super Toolkit" > "Backup" > tick off the files that you want to backup > "Back Up". - Restore Android: go to "Super Toolkit" > "Restore" > check the wanted file types > "Restore". Another thing that you can do with the tool is to capture your Android interface and directly save them to computer. To accomplish that, what you need to do is just opening the interface that you wish to capture on Android phone and then tap the camera icon on the main interface and choose "Save screenshots to computer". After that, the program will capture your Android screen and save it to computer. That's all the things you can do you with the program. It is really powerful, right? Just don't hesitate to download one and attempt it. It is doubtless that the Android assistant software can effectively simplify the Android remote control process. And here, in order to make the controlling process more smoothly and easily, you need to know some tips for using the recommended tool. Since the recommended Android assistant tool is a desktop program, it is only available on a desktop computer. Hence, please don't directly download and install it on your Android phone. If you select to connect via USB, you need to enable USB debugging on your Android if you have not turned it on. 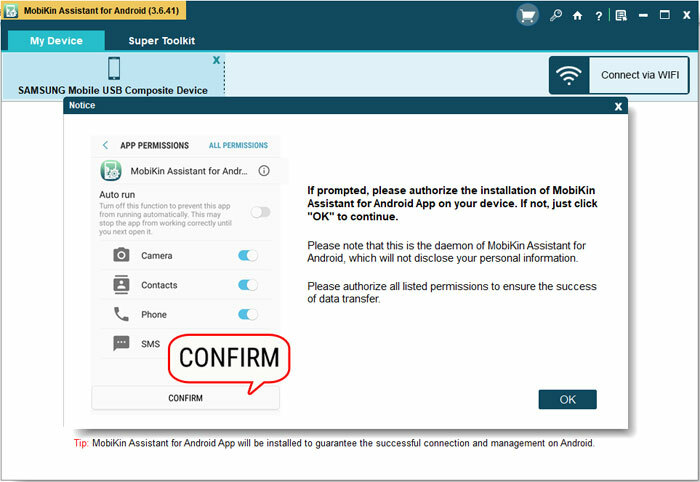 In addition, for the device running on Android 4.2 or above, you need to authorize the connection by clicking "OK" or "Allow" on your phone. 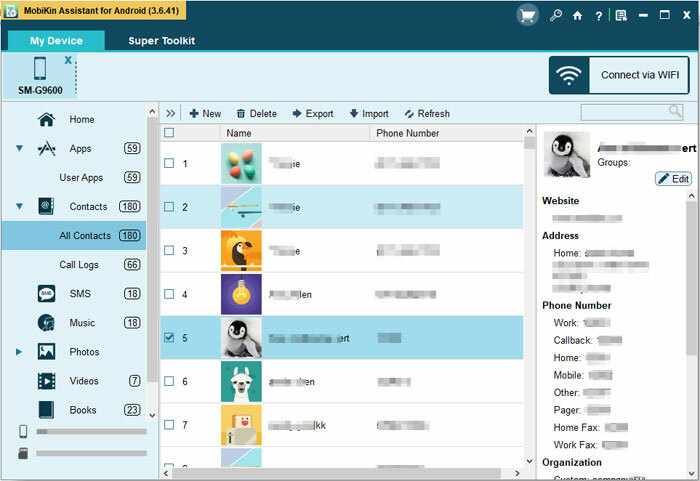 While building a connection, the program will install the Assistant for Android (Android Version) on your mobile phone automatically. Please authorize the installation or the connection will be failed. Supposed that you choose to build a Wi-Fi connection, you should ensure that your mobile phone and computer are in the same network. Otherwise, the Wi-Fi connection will be failed as well. See, controlling Android from PC is just a piece of cake as long as you have the MobiKin Assistant for Android. So if you are the one who is eager to make an Android remote control, you cannot miss this software. Just download it to have a try. And if you have any problem while using the software, please feel free to contact us. 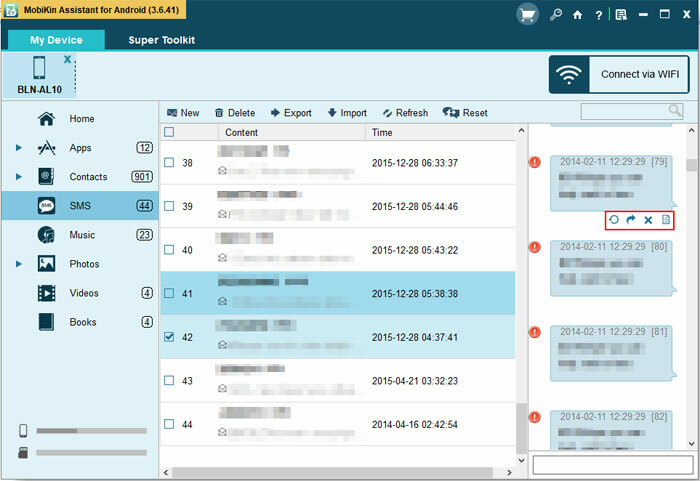 Android Call Log Manager: How to Manage Call History on Android Easily?